Normally I drive a little C2 which is roughly the same size as the Picanto so adjusting to it hasn’t been too much of a difficulty (like it’s really hard to have to adjust to driving a brand new shiny car anyway..) But as soon as I got the car from Benfield, one of the most important things.. over spacial awareness and getting used to the VERY sensitive brakes of the Kia.. was to make the car feel like it was my own. Now this may sound a little bit daft to you, but here’s my philosophy.. For me, my car is like a large scale version of my handbag, it has to allow me to stay prepared for any occasion. My mam jokes that due to inhabiting the ‘box bedroom’ of our house, my car serves as a mobile extension. But I’m not just talking about filling your motor with any old junk. No, it has to serve a purpose. Let me show you what I mean..
Ok so first of all the essentials: iphone, lipstick, sunglasses, comb. Obviously my iphone comes everywhere with me and the little compartment in the front is fitted out with a 12v plug socket (very handy for my iphone charger) along with USB and AUX plugs. 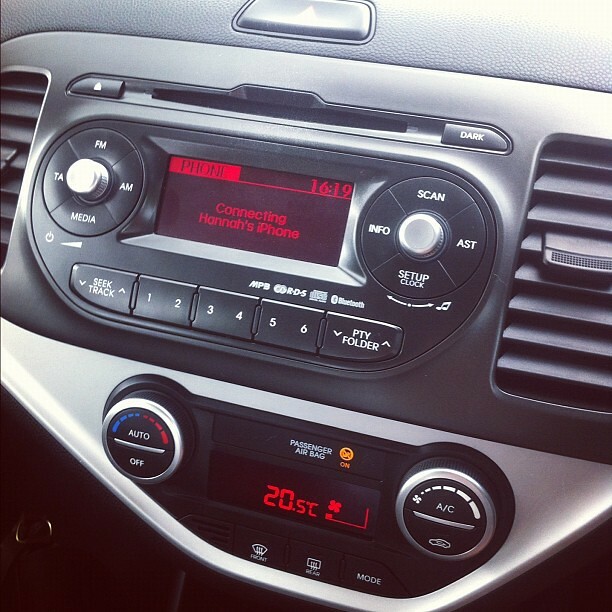 Like my car, the Picanto has an MP3 player built into the CD player so it means that it can recognise discs with MP3 format songs on.. it’s much better for making playlists since you can double (sometimes treble) the amount of tracks that will fit on. The radio and CD player can also be controlled using buttons on the steering wheel which can change the channel and alter the volume. Now it’s really naughty to use your phone while driving so the clever Kia people have added built in bluetooth, which I’ve had brilliant time playing with. It’s really easy to link your phone and means that you can answer and disconnect calls while driving through buttons on the steering wheel. I think having these various controls there is a brilliant safety feature because it allows you to change things without even having to take your eyes off the road. With the weather refusing to behave at the moment (or acknowledge that it’s summer) these three have been fail-safes for me. Keeping these essentials in the boot of my car means that even if I find myself caught in the rain while I’m out, I can still stay dry. The umbrella is the most obvious one and I actually carry two, as you can see in the other photo of the door pocket where I keep my mini umbrella. I like to have a nice big one in the boot though.. just in case! Having been caught in the flash flooding in Newcastle twice now I’ve also discovered that even if you find yourself in the middle of torrential downpour (while wearing a pair of suede shorts), a PVC rain mac is sensible way of preventing the ‘drowned rat’ look and disguising your inappropriate fashion choices. The wellies are also a semi permanent addition to my boot because there is nothing I hate more than squelching around in soaking shoes and having wet feet all day. I love these Vivienne Westwood wellies because they’re a little bit less in your face that a pair of Hunters and means that they don’t look silly if you’re dressed smartly. They also remind me a little of a shorter version of the boots worn by Audrey Hepburn in How To Steal A Million. 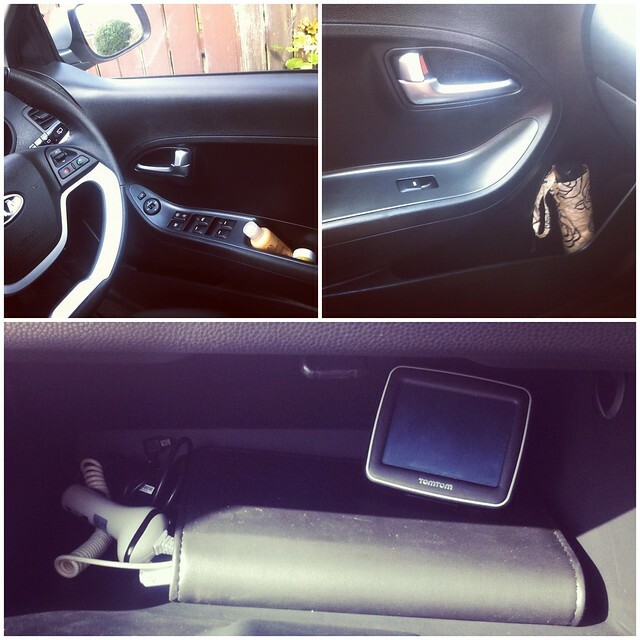 The side doors and glove compartment of my car are always great places to store bits and pieces. 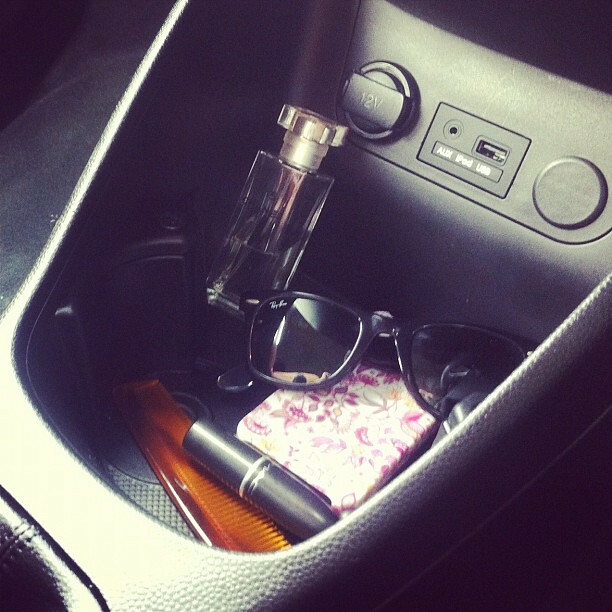 In the driver’s side I like to keep a lipbalm and a mini size moisturiser. As you know I suffer from eczema so it’s handy to keep a little bottle in my car. The Bodyshop do a great selection of miniature sized products and at the moment I’m using their satsuma moisturiser. 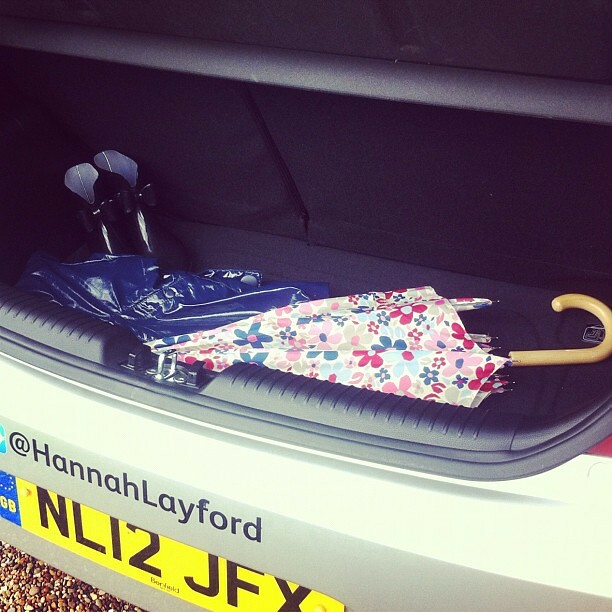 In the passenger’s side door, I keep another umbrella.. just a little one that can fit easily into my handbag. In the glove compartment I usually keep my satnav and its charger, along with the my iphone charger, the vehicle log book and sometimes a CD case (I’ve not gotten around to putting mine in yet though). So now I’ve made it my own, I think I’m ready for a few adventures.. starting with ladies night tonight! With the weekend fast approaching, I was hard at work yesterday (and will be this afternoon) with the top for Becky’s birthday so I’m looking forward to catching up with the girls tonight over dinner at Fat Buddha and showing them my new wheels. 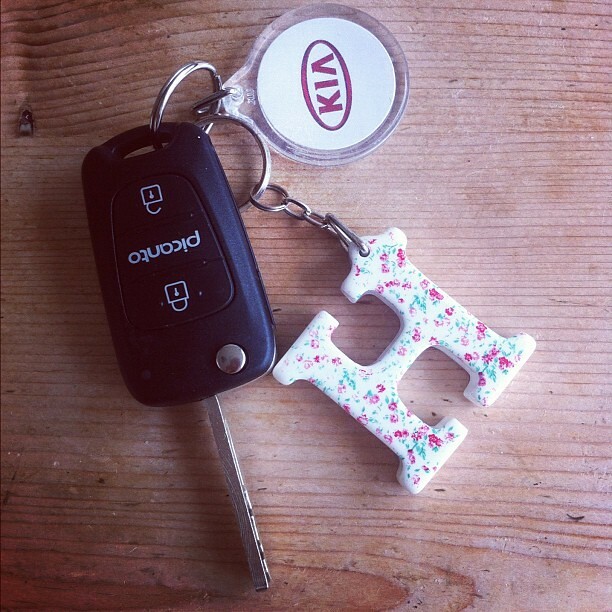 Cars are definitely handbag extensions! When I bought mine it didn't feel like 'mine' until I'd nested in it a little bit! Love that you have two umbrellas ha – fail to prepare, prepare to fail! woooooow I hope one day I can organize my car like this. Mine is always a disaster. Likee a tornado went through it. haha. serious though, this is inspiration! !